~I can't see the guild in the guild recruitment page, how do I apply? ~I returned to the game and realized I have been kicked from the guild. Why? Inactive characters will be kicked to give a chance to those who want to join the guild. An inactive character is a character that hasn't logged in for at least ~10 days. If you are having IRL issues, vacation, work or studies and you think you won't come up as often, but still want to be in KK, simply tell us about it and we will keep and wait for you. ~I've been asking for boosts in the guild but everyone is ignoring me. KK members generally don't boost. The Guild EXP and Pledged Costume will help you in your leveling, and if leveling gets too tedious you can check the guild list and party-up with a fellow guildie. ~I've been asking for *generic nest* but no one answers me. 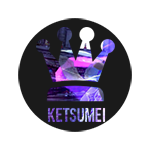 Ketsumei-Kishidan is a friendship-based guild: engaging in PVE and PVP is what the guild generally does, but that is still topped by the fact that it is mainly a spot for enjoyment and fun. Members can be busy, not feeling like it or just want to come up for a good chat. Please don't get mad if people don't answer your requests immediately and please be patient, because everyone is different and with varied priorities. ~Can I take items from the Guild Storage? The Guild Storage is an aid for the guild members who urgently need an item. It is there for their use, but please be mindful of fellow members who may need to use items as well. We'd appreciate if you could replace the items you've requested as soon as you're able to, to allow everyone else to benefit of them as well. The Guild Storage however, is not accessible to everyone: you can put items in, but to take and item out you will need to ask someone of Senior or Veteran Rank. If you need an item, message any currently available ranked member. ~Can I put my items in the Guild Storage? The guild storage should be used to store items useful for the guild and members. Any items that you intend on keeping or using for yourself should be kept in the Personal Storage. ~Can I take gold from the Guild Storage? The gold in the guild storage is used for guild benefits: guild bonuses require gold to be bought or activated. That is to prevent the Guild Master and Members from spending gold ''out of their pockets'' since the bonuses can be fairly pricey. Can the items taken out be replaced with gold cause im lazy to get new mats? can I fill the guild storage with worms and rods as Geenn? Aringoth wrote: can I fill the guild storage with worms and rods as Geenn? Only if you give a backstory and name to each single worm you decide to put into it. HOW CAN I PUT MY SCREENSHOOT IN FORUM CAE!!! !